Windsor Marquees offers the highest standards in marquee hire in the Caldicot area, priding ourselves on personal service, care and attention to detail. We aim to make your event a perfect and successful event. We specialise in marquees and accessories hiring and our dedicated staff are here to ensure you can relax and enjoy your day, whatever the occasion within Caldicot and its surroundings. With a population of around 10,000, the town of Caldicot is situated about 10 minutes from Chepstow and within very easy reach of the M4, the two Severn Bridges and other transport links, including a well served railway network. Arguably, Caldicots most famous and historic attraction is its castle, boasting a beautiful setting of tranquil gardens and a wooded country park, which visitors are astounded by the beauty of. 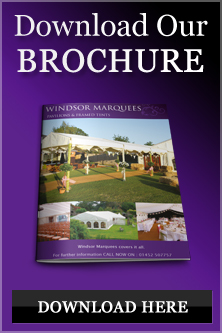 Windsor Marquees have been hiring marquees in Caldicot for the past few years, serving businesses, leisure facilities, accommodation and entertainment venues with a wide range of marquee and canopy hire.